Most popular bolt together brands of pallet racking in the market. 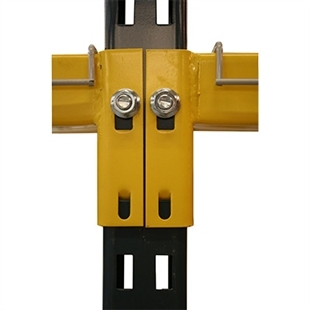 Made by Unaraco, T beams are attached to the uprights with large bolts and must be tightened properly to provide rated capacities. A tab on each beam end connector holds the beam in place with the T-bolt is installed. The T-bolt is inserted through the front of the beam turned by ninety degrees. This locks the bolt in place and the nut is then tightened over the bolt stem. 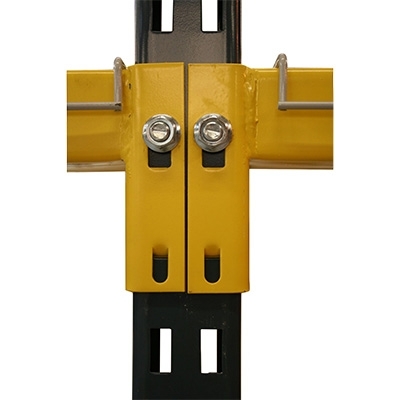 T-bolt pallet rack is usually dark blow or orange and dark blue uprights. Vertically adjustable in 2” increments.